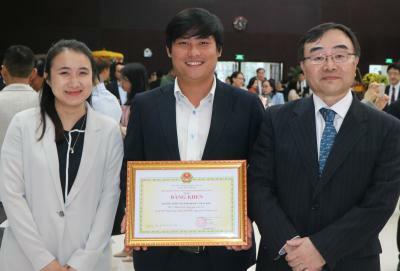 On January 25th (Fri), 2019, YNU was awarded “The Lunar New Year Get-Together 2019” held by the Da Nang People’s Committee in Da Nang city, Vietnam. This award is held annually to present Certificates of Merit to individuals and organizations for their significant contributions to Da Nang city. 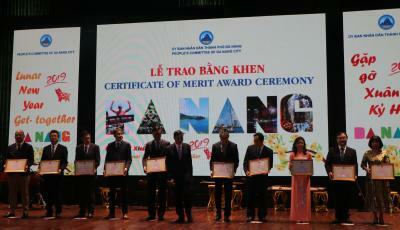 YNU was awarded for its contribution to Da Nang city in education and research activities. From YNU, Prof. Hitoshi Yamada from the Faculty of Urban Innovation attended and received the Certificate from Mr. Le Trung Chinh, Vice Chairman of Da Nang People’s Committee. 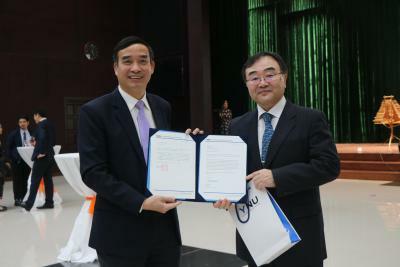 After the presentation of certificates, Prof. Yamada had a talk with Vice Chairman Chinh and transferred him the letter of appreciation from President Hasebe. Following the award ceremony, Prof. Yamada attended a banquet with UD-YNU International Branch Manager Dr. Le Anh Tuan and its Branch staff Ms. Truc Quyen. They celebrated with many guests and the related people and deepened exchanges between Vietnam and Japan. The further exchange between Da Nang city and YNU is expected to develop in the future.